The music performed by the Blackburn High School Band welcomed veterans, their families, VIPs and 250 school children from as far afield as Sale to the 72nd Anniversary Ceremony of the Darwin Defenders at the Melbourne Shrine of Remembrance on Tuesday 19th February 2014. 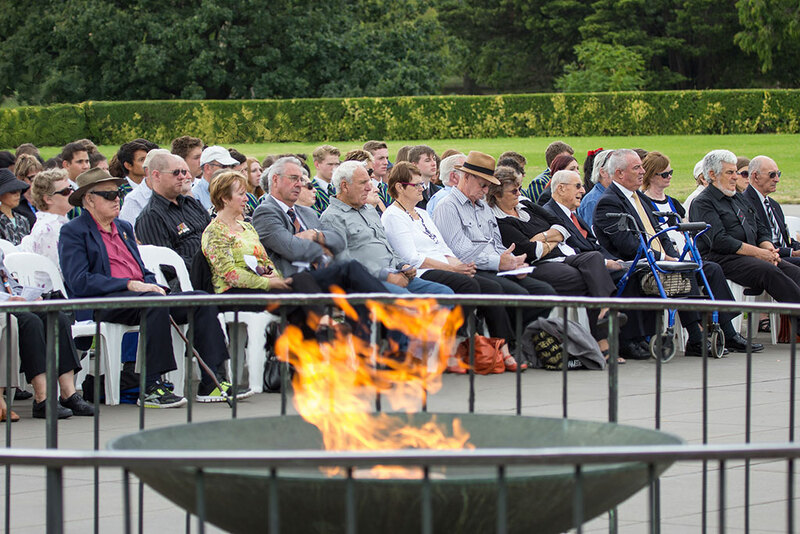 This annual ceremony is to remember the sacrifice and courage of the members who served and died during the attacks on Australia especially Darwin, during 1942 – 1945. Guest speaker Tim Gurry, assisted by two students from Wesley College, posed the question – What does the bombing of Darwin have to do with you? He encouraged all present to explore some of the mysteries surrounding the bombing of Darwin and the impact that this event has had upon a wartime generation and generations since. Tim especially directed his remarks to the young audience and urged them to study Darwin as part of their Australian History curriculum and to do all they can to honour the veterans in their own communities and preserve their memories. Mr Peter Harrington President of the Darwin Defenders re-enforced the importance of the bombing of Darwin and the determination of the Australian Defence members involved and the significance to Australia. The Guard of Honour and the catafalque party was provided by Melbourne High School and the official band was the Australian Air Force Band. All in attendance seemed genuinely moved by the ceremony and were seen to be swapping stories and exchanging wartime memorabilia. To see so many students laying wreaths that they had made themselves was a special highlight. Congratulations and thanks to the organising committee (especially Bernadette Lightfoot) for presenting a significant and memorable ceremony. Visit www.darwindefenders.com for photos and more information. This entry was posted in News and tagged darwin defenders. Bookmark the permalink.